The Maha Laxmi Bisa Yantra described in this post is believed to be a most powerful Hindu Money, Wealth, Abundance and Prosperity Attracting Charm. This Bisa Yantra can be framed or laminated and kept in the home, Puja-Place, office, factory, Godown, Cash-Cupboard-Box or any other place, which is considered auspicious for the in-flow of money and business. It can also be inserted in a Silver Locket and worn as a lucky Charm around the right upper arm. 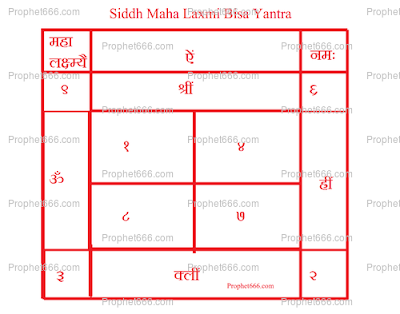 This Mahalaxmi Bisa Yantra should be made on the auspicious Hindu Tithi of Guru Pushya Amrit Siddhi Yoga, which is a most auspicious and lucky combination of Jupiter [Guru] in the Pushya Nakshatra [the constellation Delta Cancri] falling on a Thursday. On this day the Sadhak should have bath and wear Yellow Colored clothes[ Pele Kapde] and sit on a Yellow Sitting Mat[Pela Asan] and draw the Yantra on a Bhojpatra with the ink of Kesar[Saffron] using a Anar Kalam[ pointed stick of the pomegranate plant]. Then after finishing the drawing, the Sadhak should concentrate of the Mother Goddess [Mahalaxmi Mata] as the Mother of the Universe and worship the Yantra by offering it Dhoop, Diya of Pure Ghee and fresh Flowers. 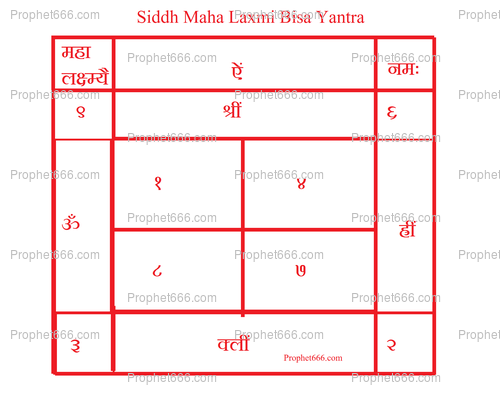 This completes the Maha Laxmi Bisa Yantra Sadhana and it should be used as mentioned above, the only thing to do afterwards is to always keep it clean and free from dust or cobwebs.